The Palladian solo vocal competition was held in the Refectory of the Holme Building on the evening of Thursday 28 March 2019. As for the solo instrumental competition earlier in the month, the room was full of College supporters, and there was standing room only. This time, the St John’s College supporters were clearly the largest contingent of any College. There were so many of them, they had to sit in two blocks – one on the right of the room, one on the left. This time, it was a pleasantly cool Autumn evening – a much more comfortable temperature than the sweltering conditions for solo instrumental. Again, the evening was compered with aplomb by a Johnsperson: this time our own Xavier Lynch, who had taken line honours to win the solo instrumental on 12 March. The Johns selectors had been treated to a smorgasbord of excellent candidates. Choosing between them was largely a matter of strategy – any of them would have represented the College well. 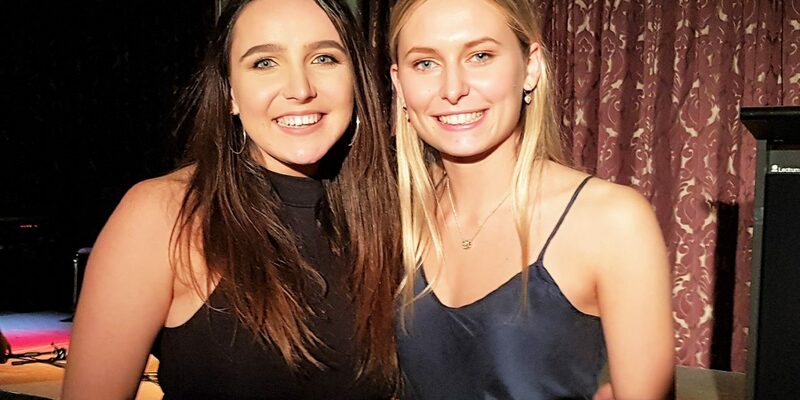 Again, St John’s fielded two brilliant musicians for the event: Cass Lobb, who is studying voice at the Conservatorium and specialising in music theatre, and Chelsea Hardiman, who is in her first year at Johns, and performed solo voice for her HSC in 2018. Cass achieved third place in the solo vocal competition last year. As always, the standard of performance at the Palladian was very high. In contrast to the solo instrumental competition which was dominated by classical performances, classical music was absent from the solo vocal competition, except for the last number – an aria from one of Donizetti’s operas bravely sung by Andrew Taylor Knight from Drews, who is studying at the Con with our Cass. Welcome comic relief was provided by Nicholas Comino from Paul’s, who sang Don’t rain on my parade by Styne, while stripping off his academic gown to reveal a tuxedo surmounted by a red crown full of large confetti and strewing red roses liberally about the audience and stage for effect. As a bonus, his intonation was accurate on occasion. It’s not possible in this short space to describe the entire event, but among the many delightful performances were Judith Browne from Drews, who accompanied herself on guitar singing Goodbye England by Marling; Audrey McGuire from Wesley (whose twin sister Charlotte, Luke tells me, is at Johns), who gave a beautiful rendition of Edith Piaf’s La vie enrose; and Lucy Andrews and Lucy Goodrick from Sancta, who gave striking performances of Where by Miller-Heidke and I’d rather go blind by Ellington Jordan respectively. Our own Chelsea Hardiman wowed the audience with a completely different form of song – ‘vocal looping’. She would record herself live singing one phrase, then play it back and simultaneously record herself singing another in harmony, and so on. She demonstrated it to the College at the University Honours Dinner last Tuesday, which gave her an excellent opportunity for a dry-run. Selectors were nervous about whether she would receive adequate support from the venue organisers for her complex equipment, but we needn’t have been concerned. The performance was faultless. It seemed effortless. The style suited Chelsea’s clear soprano voice and mastery of looping technique. The piece she had chosen – The wayfaring stranger – gave ample scope for her to communicate its emotional impact to the audience. The finest performance of the night, however, was Cass’s. She sang She used to be mine by Barelleis, expertly accompanied by our own Palladian Secretary, Felix Wallis, and by a very mellow cello played by Sam Milch. Her intonation was perfect, her interpretation insightful, and her communication with audience masterly. And the judges rewarded it. Both the judges were opera singers. Before announcing the result, they congratulated all candidates for their excellent work, and explained that they were looking for ‘sincerity’ in musical performance. They counselled singers not to copy the style of any other singers, but to find their own, in whatever kind of music they chose. Then came the announcements. Highly commended, to Chelsea Hardiman! I leave you to imagine the stamping, clapping and shouting from the John’s contingent, who had risen to their feet in chorus. Third place, to Judith Browne (Drews) for the Goodbye England. Second place, to Audrey McGuire (Wesley) for La vie en rose. (At that point, Felix and I knew it must be ….) And first place – to Cass Lobb, for She used to be mine! The Johns contingent erupted. The cheering and congratulations continued until the hall was filled only with Johns supporters. They gathered around our two victors in a circle, there followed the John’s victory chant, which I’m sure could be heard back at the College. It is only March, and 2019 has already proved one of the finest years for St John’s College in Palladian music. In both solo vocal and solo instrumental, we have achieved First Place and Highly Commended. No other College has done it this year, and I cannot recall any other College achieving the same feat. Now we have not one, but two victories to celebrate at the Victory Dinner on Wednesday 3 April 2019. Double the celebration – I’ll see you there.